Coinciding with the celebration of its 50th anniversary of its presence in Europe this year, Shimadzu has released the UV-1900 UV-Vis spectrophotometer. Equipped with an ultrafast scan function that enables data acquisition of 29,000 nm/min (it takes about three seconds to measure in visible region), this spectrophotometer operates at one of the fastest rates in the industry. The UV-1900 features a large, easy-to-use colour touch panel as well as excellent operability. All functions are directly reachable with large and easy to understand icons. In addition, UV-1900 patented LO-RAY-LIGH® diffraction grating technology ensures low stray light with high resolution and one of the largest ranges of linearity. 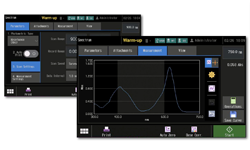 While the UV-1900 can be operated as a standalone instrument the new LabSolutions UV-Vis (Shimadzu's UV-Vis control software released simultaneously) expands user possibilities. This software also contributes to data pass/fail judgments via its spectral evaluation functions. 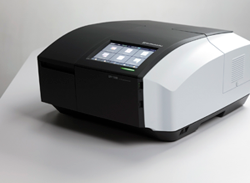 Furthermore, the spectrophotometer can connect with Shimadzu's analysis data management systems (LabSolutions DB/CS) in order to provide fully integrated data management with other analysis instruments as requested by the different guidelines and regulations relating to electronic records and electronic signatures. The UV-1900 features an easy to use interface on a colour touchscreen. Six measurement modes are directly accessible: photometric values measurements, spectrum acquisition, quantification measurements, kinetics studies, time course methods and bio methods. Compatibility with various regulations and guidelines including FDA 21 CFR Part 11.